Johann Lafer at The Gainsborough is situated in a beautiful space on the ground floor of the hotel. This restaurant with its coffered ceilings, original artwork and black marble fireplace; presents exquisite cuisine inspired by fresh and locally sourced ingredients. 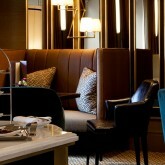 Open to both hotel guests and non-residents, the dining experience is sophisticated yet informal. 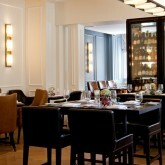 Separated by an impressive wine wall, a semi-private area can be arranged for a group of friends or colleagues. The restaurant has a separate street entrance on Hot Bath Street with access along a striking Bath stone walkway.